Please excuse my recent absence. I could blame summer and all of its excitement, but the truth is this: I’ve been sucked into the madness that is the House of Cards. The world of Frances and Claire Underwood, as deceiving and mad as it may be, is hard to look away from. As a result, I’ve been glued to my sofa for days, binge watching the series on Netflix as if my life depended on it. I’m not one to watch a ton of television; however, on the rare occasion I find something worth watching, I become hooked. Long periods of time pass has passed by as I stared, relentless and unyielding, at the screen. I’m just glad I’m on this side of the computer screen, because my unkept, unbathed, disheveled state is unappealing in every aspect of the word. Basically, I’m a hot mess. As I write this post, the last episode of the fifth season is currently paused. I want to watch it… I really do! I NEED to know what happens and how the season ends, but I also don’t want the madness to end. What will I do then? I’m not so sure I’m even capable of becoming a functioning citizen of society again. The new school year is quickly approaching, which means you’re going to need an arsenal of quick and easy recipes to keep you and the kiddos fueled throughout the busy school year. My job is to ensure the parents maintain their sanity. Grab-and go recipe options are the answer. This Apple Pie Overnight Oatmeal recipe can be prepared in advance and stored in the fridge until you’re ready to serve. The kiddos can snag a jar from the fridge in the morning and eat breakfast while the rest of the household prepares for the day. To ensure I had enough apples to make five jars of oatmeal, I grabbed the big bag of Farmers Market Gala Apples from Harris Teeter. Their private label items are high-quality products with low price tags. Their private label items are located throughout the store and can be identified by their red square logo. Shop the square this back-to-school season and save big! Each jar is filled with a healthy and naturally sweetened apple pie compote that’s made using a few simple pantry items: diced apples, maple syrup, cinnamon sticks, and vanilla extract. 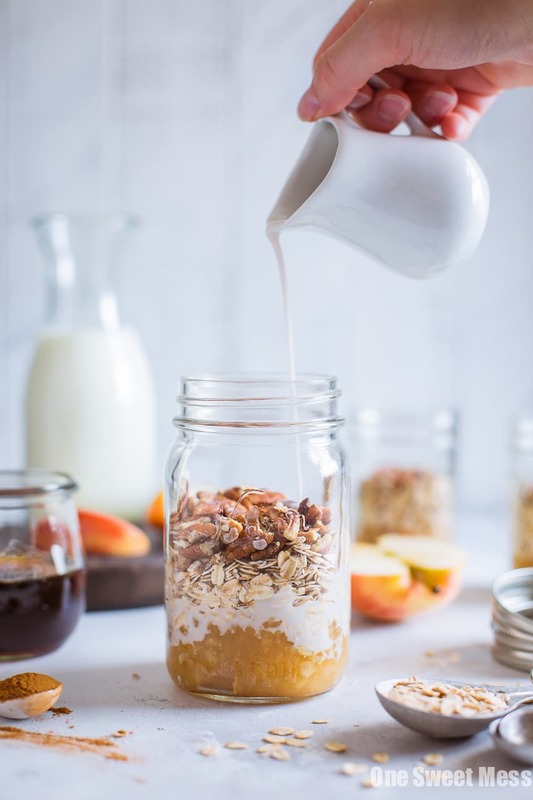 The compote is layered in portable mason jars along with gluten-free old-fashioned oats, toasted pecans, vanilla extract, ground cinnamon, maple syrup, and almond milk. A few shakes of the jar to combine, and then the Apple Pie Overnight Oatmeal is ready. Store the jars in the fridge overnight and they’re ready to go! Harris Teeter is giving 1 lucky winner a $50 gift card to shop the square this back-to-school season. Enter here using the rafflecopter. To make the apple pie compote, add diced apples, maple syrup, lemon juice, and cinnamon sticks to a saucepan. Bring the mixture to a boil over medium heat. Cook, stirring occasionally, until the apples are tender, about 12-20 minutes. Remove the cinnamon sticks from the pot and transfer the apple mixture to a food processor. Add the vanilla extract and pulse until the mixture resembles chunky applesauce. If you’re not preparing the jars immediately, transfer to an airtight container and store in the refrigerator. To assemble the overnight oats, add all of the ingredients to a mason jar. Shake to combine. Chill in the refrigerator overnight. There is enough apple compote to make 5 servings. The oatmeal will stay fresh in the refrigerator for up to 5 days. Disclosure: Thank you to Harris Teeter for sponsoring this post. All opinions are 100% my own. Thank you for supporting my site while I work with brands I use in my kitchen. I need to get back into the overnight oatmeal habit. This looks awesome! I’m saving this immediately for my busy mornings on the go! I can’t wait to try these! My kids love apple cinnamon oatmeal, so I love the idea of doing them overnight for a quick breakfast. We’re a gluten-free family too! Overnight Oats is such a win! Love the flavors of this one!